The Working Connections Child Care program pays for child care subsidies to eligible households with parents who are working or are participating in a DSHS approved work activity at the time of application and whose children meet citizenship requirements. The Seasonal Child Care program pays for child care subsidies to eligible seasonally employed agricultural families who live in designated counties and are not receiving TANF benefits. A valid social security number which verifies their authorization to work in the U.S.
You may apply by calling 1-877-501-2233 or online at Online Application for Services or come in to your local Community Services Office. Apply for services as soon as you know you will need them. Your benefits start no sooner than the day you apply. You will be given an application for your provider to complete. You will also be required to provide a copy of your in-home/relative provider's social security card and photo I.D. Once you are approved for CCSP you will get an award letter. This letter will tell you the dates you are eligible for CCSP and the amount of your co-payment. Your eligibility for CCSP is determined by your household's income and the number of people in your family. Your child care costs (or co-payment) are determined on a sliding scale. A three-person household with countable monthly income of $995 would have a $15 per month co-pay. If the same household had countable monthly income of $1,675 they would have a co-pay of $65 per month. 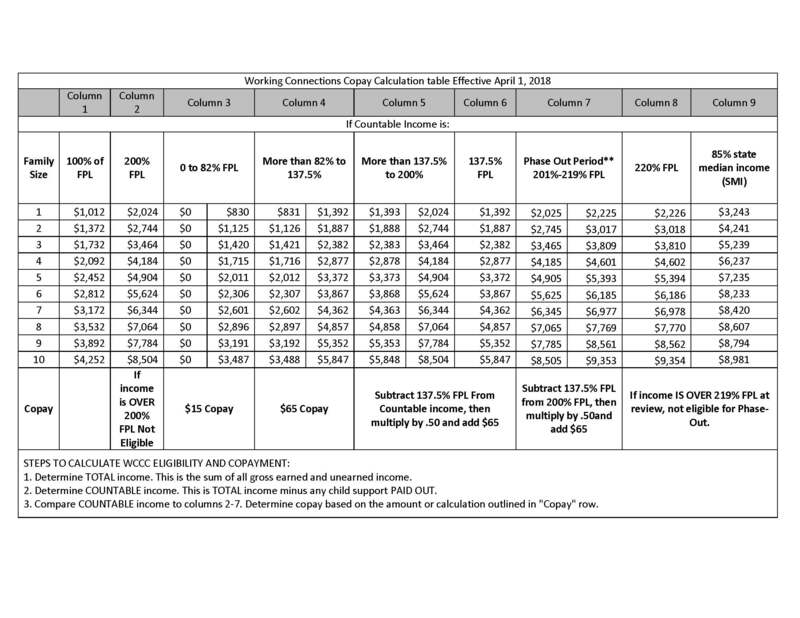 A three person household with countable monthly income of $2,400 would have a co-pay of $74. After you qualify for CCSP, contact Child Care Aware at 1-800-446-1114. They can help you find childcare in your community. Visit Child Care Aware of Washington (http://wa.childcareaware.org).